Tuesday: 'Loaded' salad night, per request of DH... any ideas for me? What do you like on your salad? Have some ideas for me? Let me know! P.S. 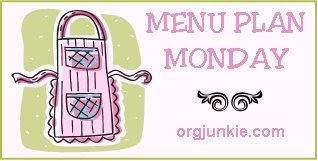 : Check out more menu plan ideas at Org Junkie's Menu Plan Monday! Ry and I always just keep it simple....cracked pepper, freshly grated parmesan, garlic croutons & Good Seasons Italian dressing. my favorite salad includes artichokes (canned & drained) and pasta - with a vinaigrette or italian dressing. Add tomatoes, olives, and whatever other veggies you like. I like feta cheese but you could use blue cheese or parmesan or whatever. I use spinach but it would be good with romaine too.